This morning was our penultimate in Japan and we awoke early to a nice clear day in Fukuoka. 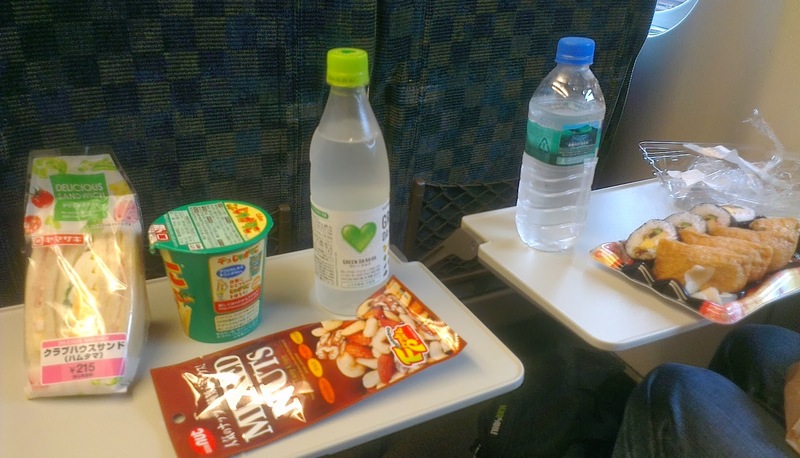 Although we had only arrived into the city last night, we were already getting ready to leave as today was allocated to an exploration of the Akiyoshi plateau and caves. The Akiyoshidai Quasi-National Park is a limestone karst plateau in Yamaguchi Prefecture at the southern end on Honshu and is known for having the nation’s highest concentration of karst formations and includes over 400 different caves. The biggest is Akiyoshidō (秋芳洞) which is famous for being the longest and most voluminous in all of Japan. The plateau is called Akiyoshidai (秋吉台) and you might notice that although the first four syllables sound the same between 秋芳洞 and 秋吉台 only the first kanji is common between them, this kanji means “Autumn” (Aki). The last kanji in both words means cave (洞 = dō) and pedestal (台=dai), so the trickiness comes about with the middle characters. They’re both pronounced “yoshi” and mean perfume (芳) and good luck (吉), though one of the alternate meanings of 芳 is also “favorable”. I’m not quite sure what’s going on with the names though I do know that until 1926 the cave was just known as “Waterfall Hole” (滝穴) but was changed to Akiyoshidō by the yet to be emperor Shōwa. More interesting than etymology though is the geology! The landscape is dominated by the aforementioned caves and thousands of white limestone boulders that are liberally scatted across dozens of grassy rolling hills. This karst topography is rare in Japan and formed thanks to rainwater dissolving the limestone that was originally deposited in a coral reef environment around 300 million years ago. When we planned our trip there wasn’t a lot of information about the area, though we did find that apart from the karstland and caves there was also a safari zoo and an Onsen. Apart from Akiyoshidō we also wanted to have a look at two other caves in the area, Taishōdō and Kagekiyodō. Japan guide has recently written an informative article about the place, though only mentions the plateau and Akiyoshidō. We had stayed in a comfort hotel last night, which meant we were able to enjoy one of their excellent included breakfasts this morning. Food on offer included eggs, cereals, fruit, yogurt, waffles as well as a selection of Japanese fare. Once we finished we checked out of the hotel, rushed down to Hakata station and caught the 8:41am Sakura train to Yamaguchi, arriving a little over half an hour later. There are a few relatively expensive buses you can use to get to the caves from various train stations but we decided to hire a car which worked out to be cheaper and much more convenient. We had actually only booked it on Tocoo a few days ago since we wanted to leave the option of taking the bus open just in case our previous hire cars were disastrous. Budget rental cars was the cheapest of the many outlets around the station and the reason for this was highlighted as we passed all the others on our hike out; it was the furthest! My luggage was on its last legs wheels and they were starting to peel and stop turning. Kate had new luggage for this trip as her last’s wheels had burst after one too many sets of bounces down staircases. Eventually we reached the Budget and were greeted by about 10 staff members in the tiny office. Compared to our other experiences it took them ages to process us but they were friendly and even offered us some ice-cream while we waited. Most of the wait was because they rung up head office to get English instructions faxed through. I talked to the guy serving us in Japanese and said that it was the fourth time we had hired a car in Japan and the second time we’d used Budget. He said that we probably didn’t need what they were faxing in that case, though I replied that we were happy to wait- just in case. I also spoke to a few of the other people who asked us where we were from and someone said they knew someone who was holidaying in Australia too. Once it was time to load up the car they were shocked about the size of our luggage and wondered if it would fit or not. I said it would (from experience) though I warned them about the weight when someone tried to lift my book filled suitcase. Oh yeah- we had a red Suzuki Swift. It was a pretty upmarket model and was the fanciest car we hired in Japan. It even had one of those new systems that let you just leave the keys in your pocket because the car will unlock and start with only the push of a button as long as the key is nearby. As usual, upon driving off from the outlet we parked somewhere nearby, but out of sight, and fiddled around with the GPS until we found our destination. The trip was quite unstressful and the GPS led us faithfully along the valley defined by the Kotō River to our destination. Upon arriving at Akiyoshi town, we were a bit unsure about parking as there were lots of tiny paid places with around three spaces managed by one guy each. It was free however to park at the visitor centre/bus terminal (temporarily), so we stopped there to have a look inside. After getting out of the car, some really old dude raved (slowly) to me for ages in Japanese. He seemed to understand what I was saying but I could not really make much sense of his replies at all. Anyway, as far as the old guy goes, we ended up just wandering away from him to have a look inside the visitor centre. We were hoping for some maps and things but it turned out there wasn’t really much inside apart from a bus station with the manned desk selling bus tickets only. So we returned to the car and started trying to work out the roads in the area so we could get to the Akiyoshidō caves. One of the mud maps we had indicated that there were a few free parking places available and as the cave was a bit like a tunnel with two entrances, we decided upon a spot located halfway between the two ends. At first we got a bit lost on the loopy roads, but somehow managed to find the car park we wanted. It was completely empty and was one of many completely free and vacant car parks! The people down the hill in the town were trying to rip people off it seemed!! Don’t fall for that scam and make sure you drive up the hill for plenty of free parking. It will be a little far if you want to visit the town though it’s not that there’s anything much to see there. 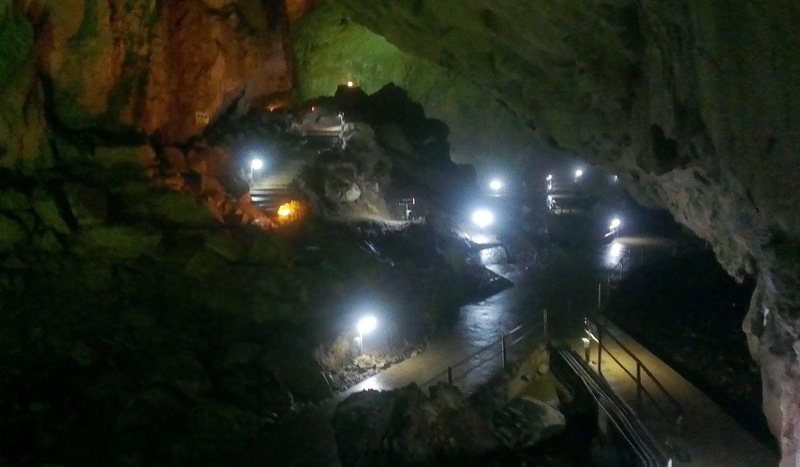 The car park we selected was for the Akiyoshidō elevator which is located in the middle of the cave and allows you to come up and have a look at the scenery above. After parking we had a bit of a look at the little elevator building and a nearby map of Yamaguchi. There was no one else around up here and so we soon started making our way down to the main entrance. We made our way down, and down, and down! The road we were following was very long and steep and we were not looking forward the inevitable climb back up to our car. In the distance we could see the smooth grass and white limestone nodules of the Karst landscape! Eventually we made it all the way to the bottom and emerged from a little snicket right at the bustling main entrance. There was shopping street leading up to this entrance filled with souvenirs/food shops and stacks of school children. Although it was already 11am most of the stores were not open, though we had a little look all the same. Upon returning back to the entrance we paid 1200 yen to receive a ticket and an English pamphlet. We then made our way down a little path that followed a small stream that flowed out from the cave entrance. The cave opening was photogenic with a small waterfall and a cool bridge over the pastel blue mineral rich water. We could actually see fish swimming in the water as well! The cave was dark as you’d expect but was lit up enough such that we didn’t have any trouble seeing features or where we were going. Thanks to all the water the ground was a little slippery and there were many signs urging caution. A different sign we saw off to the side told us it was the exit of the adventure path and we could see a small path leading high up the walls of the cave! That looked like a lot of fun and we made sure to keep eye out for the entrance as we went further in. Akiyoshidō is quite cavernous inside and had a high roof that lacked a great deal of stalactites at this point. There were not yet too many stalagmites either and the path led us out over a large open area filled with water. As we went along we found lots of information about the various sites and features and could press a button to hear explanations in a booming English voice. There were also buttons for Japanese (plus Chinese and Korean- I think), and if we happened to hit the English button first everyone else would stand around with a blank look on their faces until it was free again- and vice versa. Not too far from the beginning we found the entrance to the adventure path and paid 300 yen into an unattended box for admission and torch rental. The path was much darker than the main section and we had fun climbing up many ladders and along the high paths up on the cave wall. Some sections were a little slippery and challenging due to the large amounts of water, but we had heaps of fun! We could get up close to many interesting limestone growths that resembled the things they were named after in the same way as constellations. Not one else went on this walk while we were there and we had fun spying on the people far before. Eventually we reached the bottom of the path back near the cave entrance, put our torches in the return box and quickly traced out steps back to where we had started. Further into Akiyoshidō we came to The One Hundred Plates. I’m not sure how these water filled rings of limestone formed so you’re saved the geological lecture! They were very interesting and fun to look at any rate and lived up to their name with only minimal imagination required. Some of the other features included a huge calcareous mound named “Mt Fuji”, as well as the “Straw wrapped persimmon”, "Big Mushroom" and the “Crêpe Rock”, which was secured inside a cage. Later we came across another expanse of water that had formations similar to The One Hundred Plates but were instead termed The Thousand Rice fields. Apart from being more numerous (as expected), these rings were all located at the same level, rather than stacked. They were just as interesting and cool to look at and I have an equal lack of explanation for their formation! Around this point we started to see a few more floor and ceiling speleothems, some of which had long linked up like the King Pillar, and a wall formation that resembled a waterfall. The cave is really quite long and we used around an hour to explore the publicly accessible section. At the half way point we came to the elevator, but didn’t go up to have a look for some reason. I have no idea why not. Some of the other big limey structures we saw towards the end of the cave included the Big Buddha, Lion rock and the Jellyfish Climbing The Waterfall. Apart from the named structures there were also lots of interesting nodules and stalactites we could see up on the roof above. And there was also a growth in the middle of the path that resembled a statue. Right at the end of the cave we came to a long ramp that led up to the exit. The walls of this tunnel were covered with lots of cartoonish but artistic drawings detail the history of the area starting with the big bang, continuing though with the history of the earth and human evolution. They were really well done I thought! There was some sort of weird airlock at the end that forced us to go through two sets of doors that only opened one at a time to get out. All up the cave was very fun to explore and it alone is well worth the trip out from Yamaguchi! I highly recommended a visit to anyone visiting the southern region of Honshū! Now, although we had climbed up a little inside the cave, we still had an intense slog back up to the car. At first we walked up some steep steps through a little grove and then continued, slowly, up the long road from earlier. Upon reaching the car we then drove a short distance over to the Akiyoshidai observation area. After parking at another empty and free car park we walked up a small hill to the large observation building for some excellent views out over the beautiful rolling hills that were strewn with thousands of limestone rocks. As with Akiyoshidō, the observation area was filled with heaps of school children, though these were primary rather than high school aged. They really liked talking to me in Japanese and lots of giggles were had! I asked where they were from to learn that they were locals from Yamaguchi. There were also one or two small stores nearby as well as the starting points of the number of paths that led up through and around the karst landscape we were observing. While it would have been nice to go exploring down the trails, time was precious as always so after waving goodbye to the kids, we were soon back in the car on the way to the next cave. We didn’t totally miss out by skipping the walks as the drive up and down the karst hills was lots of fun as well. Along the way we passed a little circle of trees known as Millionaires Grove. After around fifteen minutes we arrived at our second cave, Taishōdō (大正洞= Big + Correct + Cave), and parked the car in the ample car park. This cave was much quieter than the last one and while there were a few cars parked up the other end near a restaurant/shop the cave side was practically empty. Not completely empty though, as we found a little lady waiting inside a ticket counter at which we paid 1000 yen for admission. I had heard that there was a discount pass you could buy that would provide entrance to both caves and upon asking about this was simply told to show my receipt at the next cave for a small discount. With our ticket we were given Japanese only audio guides. They were quite interesting as they looked pretty unsophisticated but somehow knew where we were as it was able to explain nearby features without any input. It wasn’t just a timer either. I tried listening at bit at the start but the audio quality wasn’t fantastic and it hurt my brain so we both ended up just exploring the cave with the guides off. We also received a touch between us which was useful as the cave, while lit, was pretty dim in places. I learnt from the audio guide that once upon a time a boy had hidden in the cave with his cows for some reason or another. For this reason the cave has historically been known as the Cattle Hiding Cave. Compared to Akiyoshidō, Taishōdō was much smaller and had lots of narrow corridors and steep steps that weaved down into the main section. This main section however was quite spacious and we spent our time wandering around and looking at the various speleothems. The route inside was more or less linear with a few side sections here and there. While it was a nice pleasant and slightly warm day outside, the cave was pretty frigid and before too long we were feeling quite cold. There wasn’t quite as much water inside the cave as the previous cave though it was still pretty damp and lots of moisture dripped down from the ceiling. One of the small ponds we saw apparently contains Shikoku Yoko Ebi, which is a rare type of cave shrimp. We also saw an abyss, and another jellyfish themed rock. At the very end of the cave we reached a sign saying that we'd reached the end. From there we retraced our steps slightly, followed a tunnel, and exited through some doors. The route underground is basically a half loop and from the exit we walked back along a forest path to the entrance and car park. On the way we saw some steps leading down into another cave on the opposite side of the path. This cave had collapsed at some point though so there was no way you could go down and explore. 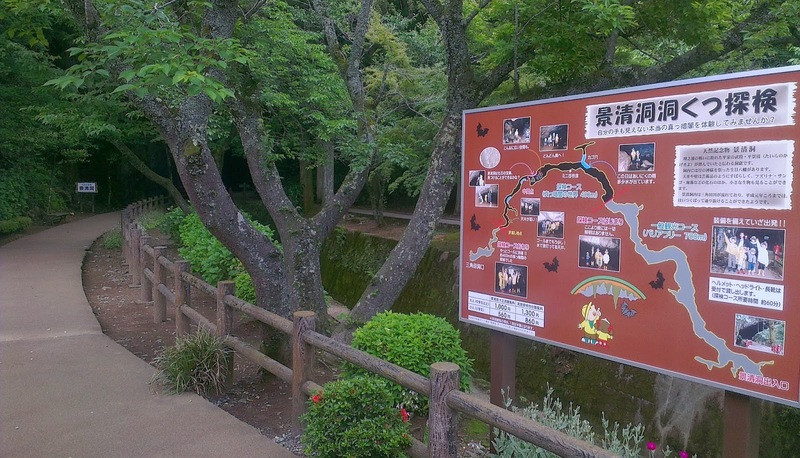 The Taishō cave was fun and definitely worth our time and money though was probably our least favourite of the three. I’d still certainly recommend checking it out if you’re in the area and have the time! After arriving back at the car we drove the short distance to Kagekiyodō (景清洞 = scenery + pure + cave), parked the car, and walked through a clover filled playground to the entrance. We were successful in using the Taishōdō receipt to obtain a half price discount of 500 yen, but before paying the lady at the counter asked us if we wanted to go on the adventure section- which would cost a little more. After a bit of back and forth in Japanese I learnt that this would involve continuing on from the general section into the dark, narrow and wet area beyond. As we’d had fun with the last cave adventure course we said yes, and paid the 300 yen extra. The lady then came out from behind the desk, gave us helmets, torches and explained the route using a big information map. This cave was a simple in that it only had one entrance so we’d be retracing the entire trip upon reaching the end. I translated for Kate, however as the lady talked a lot it was hard just remembering everything she said. It was basically things like “It’s wet here so stay to the left”, “It’s low so duck for 10m here”, and “Have a look at the oolites in this rock”. She also told us to make sure to turn off both our hand-held and helmet torches once we reached the end so we could appreciate the ink black darkness of the cave. Kate was a bit worried because the lady probably talked for five minutes and I only relayed about 30 seconds of information! I assured her that what I said were the important bits. After the talk one of my lingering questions was answered when we were brought around to the back of the store to swap our shoes into gumboots. We were asked what size we were but of course had no idea about Japanese sizes so had to try a few different ones. Once we were fully kitted up the ticket lady got us to stand in front of the map and the cave entrance for a “Commemoration Photo”!, taken with our own camera. 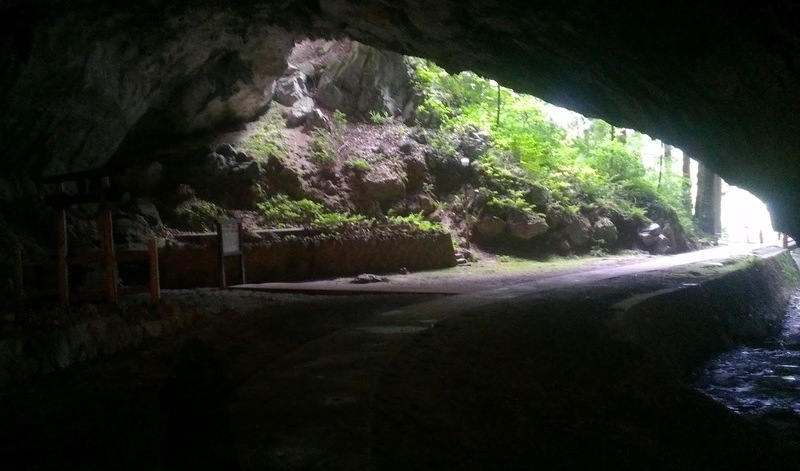 Right before entering a school teacher came up to us and said that his class was currently inside the cave doing the same adventure walk, and that we ought to say “Motoyama!” when we passed them. He was looking after a primary school aged kid who sadly could not go into the cave as she currently had a broken leg. I’ve just now looked up Motoyama and there is indeed a “Motoyama Primary School” located in the southern part of the Yamaguchi Prefecture. The first, regular part of the tunnel was pretty wide, spacious and had various limestone features like the earlier caves. Just judged on the first section it would probably be the least interesting cave. However we did see some little bats flash past us up into high crevices, which was pretty cool. Apart from that there were also some big calcareous mounds that you could climb up and areas of water. The adventure course starts at the 700m mark (and then continues another 400m) but a little before we reached that point we heard and then saw the class of school children we’d been told about. In reply to the inevitable Haro’s (hello), I said “Motoyama!” as instructed. The kids acted very surprised and amazed by this with lots of open mouths- it was quite hilarious! I did feel a bit weird and embarrassed saying it at the time as I didn’t know if it referred to their school name or what. It was strange just shouting out a random word that’s not in a sentence. We made sure to switch on our head lamps, and then duck walked under the low 100cm-ish high roof for a couple of metres. It was a little tricky and we were very glad for our helmets which protected our heads from many bumps on the uneven ceiling. Eventually the roof got higher and we could freely stand up. It was completely dark by now, however our lamps provided adequate illumination in the direction we were looking. We had a lot of fun making our way through the dark cave and coming across unexpected pockets of water and rocks. I remembered the guide ladies instructions more or less, so we were able to avoid any deep ponds of water by sticking to the appropriate side of the tunnel at different corners. Looking at the rocks surrounding us we could see some gold coloured flecks within the limestone. We also we made sure to observe the oolites in the particular boulder we’d been told about. he turbulent wave action throws the nodules around and causes then to form into this circular shape. Later the modules are welted together with further calcium carbonate cement to form an oolitic limestone rock. Towards the end of the adventure course we came to another low section that was even lower than the first section, and much longer at about 30 metres. We did another squat walk under the dripping ceiling and eventually came to a small higher pocket that was the end of the route. As instructed we made sure to turn off all our lights and were enveloped by a cloak of thick blackness. The darkness was such that it made a moonless night in the country look like dazzling sunlight. We couldn’t see our hands even if we put them right in front of our face! We made sure to stay in the dark for a few minutes to let our eyes adapt however we could not detect any difference at all. I doubt we’d notice anything even if we let our eyes adjust for the full ninety minutes required to archive full dark adaptation. After our lurk in the gloom it was time to turn our lights back on and duck back down again to head back. I actually turned my lights off and carefully walked in the dark for sections of the return trip after memorising the terrain ahead- which was fun! Kate was a little ahead of me at that point and while I could see her light as an isolated bright spot, she quickly disappeared (as I was walking slower) and it became completely dark. Apart from that, I also tried to take some photos of this section though I had some difficulties as it was very dark and my camera was almost flat. The flash wasn’t too helpful either as it would cause something in the foreground to get overexposed and render everything else black. I tried to take long exposures and use my touch to light up the field of vision. Once we reached the normal section we continued walking back, with stops at the places we’d missed earlier. It was somewhere around here that my camera died and I had to swap to my phone’s inferior lens. Upon reaching the tunnel entrance we exited and headed over to the ticket entrance. After swapping our shoes back we said thanks to the lady who asked us how we went with the low sections and if we made it to the end. We gave a demonstration on how we had ducked down and she laughed and said good job! After a final thank you we made our way back to the car, drove back through Akiyoshidai and then continued all the way back to Yamaguchi Station. Right before arriving we stopped up at a petrol station to fill up and have the required paperwork filled out. This time Kate allowed me to drop her and the luggage off at the station while I went to return the car. We once again passed the quick inspection but I was unable to make a quick get away as the staff wanted to chat for a bit! Somehow I managed to escape back to the station where Kate was waiting patiently. After dragging our luggage over to the ticket office we looked up at the passenger capacity indicator screens and were met with an unwelcome sight. It looked like the next, 17:18, Sakura Shinkansen was fully booked! Once we reached the head of the line we asked anyway and were told that it was indeed completely full. Most of the following trains were Nozomi, which we cannot catch using the JR-Pass, and the later options would not get us into Kyoto until nearly 9pm. If we could get onto the earlier train we’d get in a whole hour earlier at 8pm. We decided to take our chances in the unreserved section as even if there were not enough seats we hoped for enough room to just stand at least. As standing up for the first two hour leg of the journey wasn’t an inviting prospect we made sure to hurry over to the platform and wait the twenty five or so minutes until the train was due. One of us staked out a spot while the other went to get food for the journey and then vice versa. I had looked at the markings on the platform and lined us up with the back of one of the distant unreserved carriages. Shin-Yamaguchi is a station that only some Nozomi stop at and it was the first time since our first trip that we were able to watch them race by! Quite a few shot through while we were there and it was heaps of fun watching, hearing and feeling the trains zoom past us at 300km/h only a dozen or so metres away. As time went on other people started to line up, but not at the position we were waiting at. A Japanese lady from one of the other lines came over to us and told us we were at the wrong spot. We initially moved over to where she was, but after rechecking the platform markings several times we moved back. When our train finally came the door we wanted stopped right in front of us and we were able to quickly hop on, stash our bags at the back of the car and grab the seats directly in front. We were worried that the carriage would already be completely full from previous stations but it was only moderately so. We later realised that what seemed to be an entire school had booked out the reserved cabins; if it wasn’t for that one big hundreds strong group it would not be so busy. After a late transfer to our first ever Kodama we finally arrived at Kyoto station at around 8pm. Our hotel was located 450m from the station and was easy for us to find. Along the way we passed a really flashy and fancy Pachinko parlour. 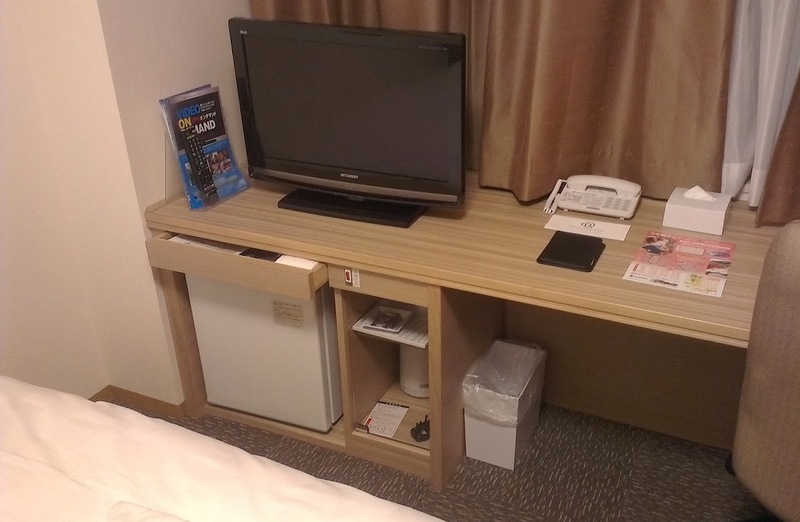 Finding cheap and nice hotels near Kyoto Station can be tricky as it’s a popular location but we managed to find the Daiwa Roynet Hotel Kyoto-Hachijoguchi for only 8500 yen a night. Quite a few people were trying to check in when we arrived, so we had to wait a little. Some American tourists ahead of us seemed to be causing difficulties and it took them about fifteen minutes to check in. I have no idea what the problem could have been as it only took us thirty seconds. 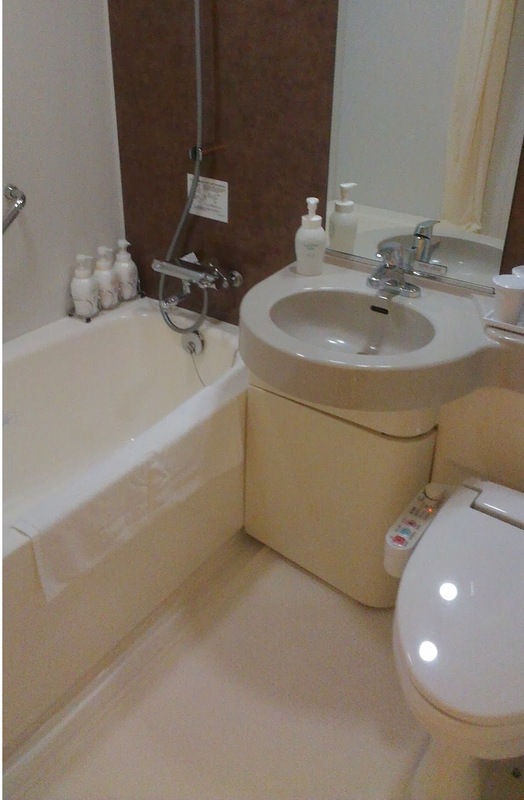 The Daiwa Roynet Hotel was pretty new (which may have explained the price) and we were very happy with it. 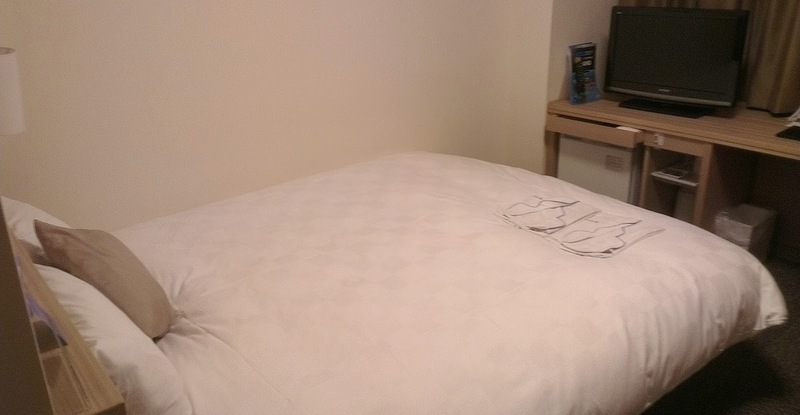 Our room was small but not excessively so and everything was nice and new. Tonight was sadly our last in Japan and we spent most of the rest of the night packing our bags. I spent quite some time as I had to try and fit as many books as possible into the 25kg limit of my main luggage and find some place to carry the rest with our carry on. This was especially tricky as we had no scales. We also, tragically, had to say goodbye to the fireworks we had bought but were not able to use. I made a big sign saying that they were unwanted fireworks and put them on the bench. I didn’t want to responsible for a bin explosion. Our plane tomorrow wasn’t due to leave from the Kansai International Airport until the late evening which meant we still had another half and a bit day to see some more sights of Kyoto. Although this is our third trip we still haven’t come close to seeing all Kyoto has to offer and tomorrow we’ll be visiting a few of the temples surrounding the philosophers path. If you enjoyed reading this post or found any of the information useful please consider leaving a comment. I really enjoy reading them! Are you considering visiting or have you recently travelled to Akiyoshidai or Akiyoshidō?